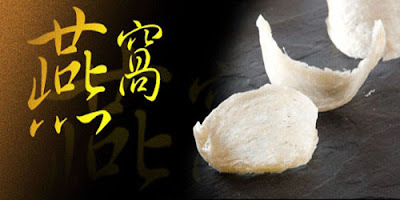 好主意 - Food Lover's Ideas: What is Bird's Nest? Bird's Nest (in Chinese: 燕窩) has been know & used by Chinese communities for centuries as a health food. It is actually the salivary glue of Swiftlets (Collocaliini) taken from their nests. Swiftlets are distributed mainly in the Indian Ocean, Southeast Asia and North Australia. With it high market value, Bird's nest has been promoted by marketers as highly nutrition food, which is good for skin, anti-aging, lowering risk of disease, and longer life span. Traditionally, it is double boiled with rock sugar. Many celebrities and riches claimed to eat Bird's nest everyday. What is the Nutrition Value of Bird's Nest? According to scientific research, bird's nest contains mainly carbohydrates, amino acids and mineral salts, glycoproteins, sialic acid, galactosamine, glucosamine, galactose, fucose, etc. Sialic acid has advantages in infants. While some amino acid found can facilitate body's repairing and immunity. Is Bird's Nest Good or Bad for Cancer Patients? Scientific evidence was given by Ng et al. (1986) in Hong Kong, suggested that bird's nest might possess immunoenhancing effect by aiding cell division of immune cells. In 1987, other scientific evidence was published by Kong et al, demonstrated an epidermal growth factor (EGF) that stimulated the DNA synthesis in 3T3 fibroblast in a dose dependent manner in vitro. EGF is a 6,000 Da polypeptide hormone produced by glands of the gastrointestinal tract, namely the salivary and Brunner's glands. It appears to play a crucial role in major normal cellular processes such as proliferation, differentiation and development. It may offer a rationale for the medicinal use of edible bird's nest in ageing resistance. Since the receptor for EGF is highly expressed in a number of solid tumors, including breast, head-and-neck, non-small-cell lung, renal, ovarian and colon cancer, people are worried about a possibility to induce tumor progression and to resist chemotherapy/radiation treatment in tumor cells; in consequence, suggest that cancer patients should avoid bird's nest. However, there is no evidence supporting this suggestion. Scientific evidence for its efficacy is still limited.